After a month or two of trying, i finally managed to get myself the shot i wanted of this bird, the 'ground level shot' and believe me it isn't easy crawling on that rugged terrain. Both these images were shot with a Sigma 135-400mm DG APO(hand-held & manually focused) mounted on a Canon EOS 350D(borrowed from my friend Piyush). The other day i met a photographer in another vehicle who was shooting next to our vehicle, and said i got better images than him, as i had used the Canon 1D MkII, this is my reply to him, i have used one of the basic cameras here, and hand-held and manually-focused! Wow, one has to click to enlarge these pictures. The second is awesome, stunning... Great quality and beautiful sharpness!!! Mate you are an artist! Great shots as always Angad....simply stunning! 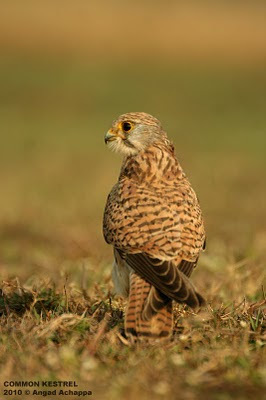 Fantastic shots, too often people ignore the photographer and praise the equipment Well done for your effort. Super work Angad whatever the gear you handle. 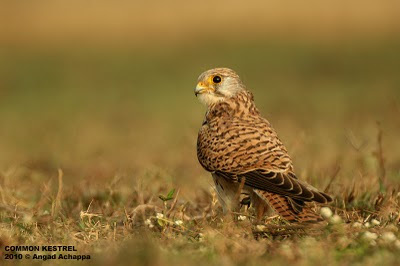 These are nice pictures of common kestrel.I have never seen such close photographs of common kestrel.I think this needs so much patience to take this much close photographs. Nice Picture man. Amazingly capture.will follow ya. Great raptor shots! Nice to see them at ground level.